Witness the natural beauty of Kerala in Idukki. Read the following article to know more about the tourist sites in Idukki. The real natural wealth of the state of Kerala lies in Idukki District. The charming district contains the state’s highest mountain peak and also the largest forest cover. Some of the major rivers of Kerala, which include Periyar, Thalayar, Pamba and Thodupuzhayar, flow through the district of Idukki. The district also holds the distinction of being home to Asia’s first and the second biggest arch dam in the world. This magnificent dam has been built across Kuravan Kurathi Mountain. The district is also famous for Thekkady Wildlife Sanctuary, which is one of the important tourist attractions of Kerala. Spread over an area of 777sq. km, this wildlife sanctuary is shelter for several species of animals including elephants, bison, jungle cats, tiger, sambar deer, wild dogs, wild boar, snakes and birds. Idukki also boasts of having the second underground power station in world, situated in Moolamattam. Idukki provides you the opportunity to visit Thekkady, which has one of the largest wildlife sanctuaries in the country. Also known as the Periyar National Park, the sanctuary is spread over a vast area of 777 sq. km; half of the park is covered with thick evergreen forest. 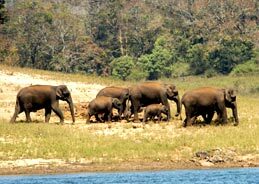 Thekkady is known for herds of wild elephants that stroll near Periyar Lake. Mangala Devi Temple is located 15 km from Thekkady. Covered with lush greenery, the century-old temple has been built in Pandian style. The temple remains closed for most of the time and opens only during the festival of Chitra Pournami. During other seasons, tourists have to obtain permission from the forest ranger in order to enter into the temple premises. The spectacular views from the temple premises make it a worthy effort. Peermade, popularly known as Peerumedu, is a very beautiful hill station and erstwhile summer retreat of the Maharajas of Travancore. People visiting Periyar National Park will definitely love this cool hill resort. Visitors can enjoy the lush plantations of tea, coffee and rubber along with cool views of pine forests and natural grasslands. Eravikulam National Park is situated along the Western Ghats. Known for its considerable population of Nilgiri Tahr, this national park is also shelter for dozens of other species such as Gaur, Sambar Deer, Indian Muntjac Golden Jackal, Wild dog, Dhole, leopard and tiger. Standing 2694 meters high above sea level, Anamudy is the highest mountain peak in Kerala. The magnificent peak is located on the south of the Eravikulam National Park. Anamudy provides great trekking opportunities for adventure lovers. Chellarkovil is beautiful village located in Idukki district. The village provides a golden chance to witness the typical life in rural areas of Kerala. There are various picturesque sites for visitors, such as lush green fields, plains and waterfalls. For nature lovers, Thommankuthu offers beautiful waterfalls. This place is ideal for trekkers and adventurous people. The spectacular views around make it a must visit site for tourists. The nearest airport is Nedumbassery International Airport in Cochin, which is 120 km away from Idukki. Idukki can also be reached by railways. The nearest railway station is Kottayam, at a distance of 133 km from the city. Idukki is well connected to other major cities and towns of the state by wide network of roads.